I’d like to explain a conjecture about Wigner crystals, which we came up with in a discussion on Google+. It’s a purely mathematical conjecture that’s pretty simple to state, motivated by the picture above. But let me start at the beginning. Electrons repel each other, so they don’t usually form crystals. But if you trap a bunch of electrons in a small space, and cool them down a lot, they will try to get as far away from each other as possible—and they can do this by forming a crystal! This is sometimes called an electron crystal. It’s also called a Wigner crystal, because the great physicist Eugene Wigner predicted in 1934 that this would happen. Only since the late 1980s have we been able to make electron crystals in the lab. Such a crystal can only form if the electron density is low enough. The reasons is that even at absolute zero, a gas of electrons has kinetic energy. At absolute zero the gas will minimize its energy. But it can’t do this by having all the electrons in a state with zero momentum, since you can’t put two electrons in the same state, thanks to the Pauli exclusion principle. So, higher momentum states need to be occupied, and this means there’s kinetic energy. And it has more if its density is high: if there’s less room in position space, the electrons are forced to occupy more room in momentum space. When the density is high, this prevents the formation of a crystal: instead, we have lots of electrons whose wavefunctions are ‘sitting almost on top of each other’ in position space, but with different momenta. They’ll have lots of kinetic energy, so minimizing kinetic energy becomes more important than minimizing potential energy. When the density is low, this effect becomes unimportant, and the electrons mainly try to minimize potential energy. So, they form a crystal with each electron avoiding the rest. It turns out they form a body-centered cubic: a crystal lattice formed of cubes, with an extra electron in the middle of each cube. It’s mainly famous as the average distance between the electron and a proton in a hydrogen atom in its lowest energy state. Simulations show that a 3-dimensional uniform electron gas crystallizes when the Wigner–Seitz radius is at least 106. The picture, however, shows an electron crystal in 2 dimensions, formed by electrons trapped on a thin film shaped like a disk. In 2 dimensions, Wigner crystals form when the Wigner–Seitz radius is at least 31. In the picture, the density is so low that we can visualize the electrons as points with well-defined positions. The lines between the dots are just to help you see what’s going on. They’re showing the Delauney triangulation, where we draw a graph that divides the plane into regions closer to one electron than all the rest, and then take the dual of that graph. Most electrons have 6 neighbors. But there are also some red defects, which are electrons with 5 neighbors, and blue defects, which are electrons with 7 neighbors. Note that there are 6 clusters of defects. In each cluster there is one more red defect than blue defect. I think this is not a coincidence. is minimized, and draw the Delauney triangulation, there will be 6 more vertices with 5 neighbors than vertices with 7 neighbors. Here’s a bit of evidence for this, which is not at all conclusive. Take a sphere and triangulate it in such a way that each vertex has 5, 6 or 7 neighbors. Then here’s a cool fact: there must be 12 more vertices with 5 neighbors than vertices with 7 neighbors. If we think of the picture above as the top half of a triangulated sphere, then each vertex in this triangulated sphere has 5, 6 or 7 neighbors. So, there must be 12 more vertices on the sphere with 5 neighbors than with 7 neighbors. So, it makes some sense that the top half of the sphere will contain 6 more vertices with 5 neighbors than with 7 neighbors. But this is not a proof. I have a feeling this energy minimization problem has been studied with various numbers of points. So, there either be a lot of evidence for my conjecture, or some counterexamples that will force me to refine it. The picture shows what happens with 600 points on the disk. Maybe something dramatically different happens with 599! Maybe someone has even proved theorems about this. I just haven’t had time to look for such work. The picture here was drawn by Arunas.rv and placed on Wikicommons on a Creative Commons Attribution-Share Alike 3.0 Unported license. This entry was posted on Thursday, December 7th, 2017 at 4:41 pm and is filed under mathematics, physics. You can follow any responses to this entry through the RSS 2.0 feed. You can leave a response, or trackback from your own site. Why is the potential energy and not ? Sorry, I was rushing and made a mistake. I’ll fix it. … at least in the limit where the number of particles approaches infinity. I think the case of 7 particles would be a good one to try, to see this effect. An electron gas where the particle motion is limited in two dimensions but the field lines are not limited, will have 1/r interaction. Yes, that’s what I said in my article. Puzzle solution: Let v, e, f be respectively the number of vertices, edges and faces of the triangulation, and let d be the difference between number of vertices with 5 edges and vertices with 7 edges. By counting edges using faces we get e = 3f/2, and by counting vertices using faces we get v = (3f + d)/6. Plugging it all into Euler characteristics (v – e + f = 2) we get the equation (3f + d)/6 – 3f/2 + f = 2, where all f’s magically cancel out and we are left with d = 12. Yes! Nice! It’s neat to see how the 12 pops out, though it’s not exactly surprising. Sub-conjectures, then: electrons on the boundary always have four neighbours each (so pasting in a second copy of the whole makes a sphere, and introduces no 5- or 7-neighbour electrons); and any configurations with 4 or 8 neighbours can relax further. Theorem. Given a triangulated disk, if each vertex in the interior has 5, 6 or 7 neighbors, and each vertex on the boundary has 4, then there are six more vertices with 5 neighbors than with 7. Proof. Take two copies of the triangulated disk and attach them in the obvious way, attaching each point on the boundary of one to the corresponding point on the boundary of the other, to form a triangulated sphere. Now the vertices that were on the boundary all have 6 neighbors. 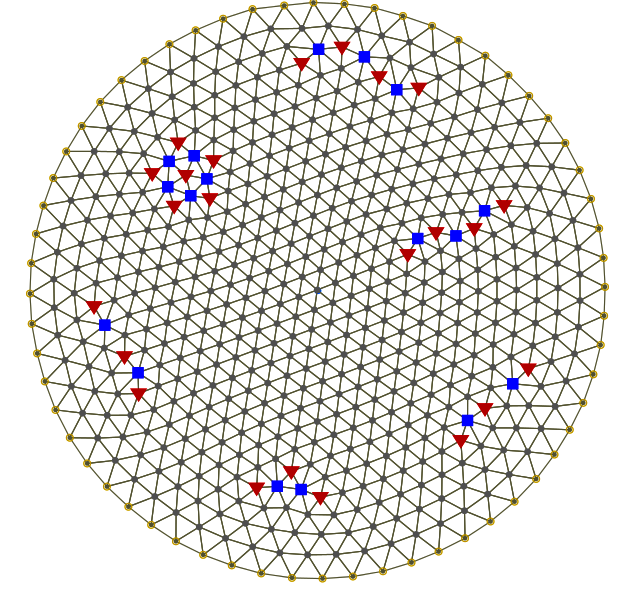 Thus, every vertex in the triangulated sphere has 5, 6, or 7 neighbors. However, because the Euler characteristic of a sphere is 2, there must be exactly twelve more vertices with 5 neighbors than with 7. (See the proof earlier in these comments.) Thus, in each copy of the triangulated disk, there must be six more vertices with 5 neighbors than with 7. Of course you mean “because the Euler characteristic of a sphere is 2,” and each 5-way vertex accounts for 1/6 of this. A reasonable way to think about it is to imagine all the triangles as equilateral (even if they’re not really). Then a vertex with 6 neighbors is flat, a vertex with 5 neighbors has an angle deficit of 60° a vertex with 7 neighbors has an angle excess of 60°, and so on. This, combined with the fact that any triangulation of a 2-sphere needs to have a total angle deficit of 720°, gets the job done. It’s a discretized version of the Gauss—Bonnet theorem. Related question: when N>>120 balls are packed in S3 (positively curved 3space), presumably they form regions of face-centred cubic and/or body-centred cubic, but what are the defects like? Are they concentrated around 120 points, or along arcs, or what? That’s an interesting question. In flat space, the ‘packing balls as densely as possible problem’ leads to the face-centered cubic (or infinitely many other equally dense packings which are not lattices in the mathematical sense). The ‘minimizing energy of particles repelling each other with an inverse square force law’ problem leads to the body-centered cubic (uniquely?). The body-centered cubic is less dense than the face-centered cubic, and presumably the body-centered cubic has less energy per particle than the face-centered cubic. Now, on to the 3-sphere. I don’t know the solution to either problem in this case. In the limit of large numbers of balls (resp. particles) I’d expect large patches of face-centered cubic (resp. body-centered cubic). But I don’t know what the defects are like. • Ann Davis, Scott Malloy, Michael Neubauer, Mark Schilling, William Watkins, Joel Zeitlin, Potential minimizing configurations of points on the sphere. I’ve got a little list . . .
• A. Worley, Minimal energy configurations for charged particles on a thin conducting disc: the perimeter particles. One interesting thing I hadn’t guessed is that the particles often lie on concentric shells. Abstract. The lowest energy configurations for N equal charged particles confined to a thin conducting disc have been investigated in detail up to N = 160 and in outline for further values up to N = 500. For all values of N up to 160 the particle configurations can be described in terms of concentric shells. The number of perimeter particles p appears to be simply related to N and to the mean radius of the outermost internal shell. Justification for these relations is obtained from a simple model based on the well-known distribution of continuous charge on a conducting disc. In the range N ≤ 80, the configuration for N + 1 is, with one exception, the same as that for N with the addition of one particle to an existing shell or the creation of a new shell with a particle placed at the centre. The single exception is the pair N = 55 (with shell structure 5-13-37) and N = 56 (with shell structure 1-6-12-37). For the range 81 ≤ N ≤ 160 there are four exceptions to the usual pattern: N = 97–98, 117–118, 150–151 and 152–153. 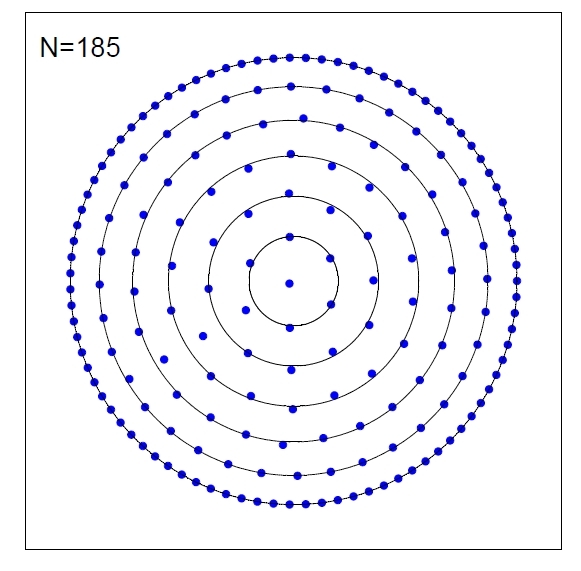 The first case where the particles don’t lie on concentric shells is N = 185. Their Figure 5 (N=520) is similar to the figure at the top of your post. There are very nice results in this paper – for example, a description of some common defect patterns. Such patterns should appear in a large 2d Wigner crystal for a large variety of potentials (i.e. parabolic potential, square well potential on a disc, etc. ).